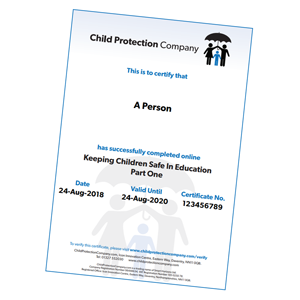 The Keeping Children Safe in Education course is designed to help you quickly and easily ensure that all of your staff have read and understood the statutory documentation. Covers both Part 1 and Annex A of Keeping Children Safe In Education. Save days of time on administration, as the system will automatically chase staff. Easily evidence to Ofsted that all of your staff have read and understood the statutory guidance. All school and college staff should read part 1 of this guidance. School and college leaders and those staff who work directly with children should also read Annex A. Why do I need a Keeping Children Safe in Education online training course? The training ensures that your staff have not only read but also understood the guidance. The management system can you save you days of time. It will automatically chase staff who have not taken the training and will build a central record of all completed training. When Ofsted visit you can readily demonstrate compliance. A single licence covers everyone within a school to take the training for a year. The cost is £195 for primary schools and £295 for secondary schools. N.B. If your school is part of a multi-academy trust (MAT), please contact us for MAT pricing. Ensuring all of your staff have read and understood the statutory guidance can be a time-consuming process. Our online training course can save you days of administration. Just upload the names and email addresses of your staff and the system does the rest. Staff can take the training 24/7 and system will automatically chase anyone who has not yet completed the training. A single fee of £195 for primary schools and £295 for secondary schools covers all of your staff for a whole year. You can retrieve centrally held online training certificates at the touch of a button. So when Ofsted visit, you can readily demonstrate that all staff have read and understood "Keeping Children Safe in Education"
Upon successful completion of the course, you’ll be able to download a personalised training certificate valid for 2 years. This course covers Part 1 and Annex A of the statutory guidance "Keeping Children Safe In Education". All staff working in schools in England must read at least Part 1. School and college leaders and those staff who work directly with children should also read Annex A. This short module explains how to use the Keeping Children Safe In Education course. You will be able to select whether you require Part 1 and Annex A of the course i.e. you work directly with children, or otherwise just Part 1 only. The final module will allow you to show you have read and understood the statutory guidance.